Anxiety. Nerves. These emotions plague as all at one time or another—or do they drive us? Early November 2015. A group of men sit on four couches arranged on a darkened stage. A small audience waits with baited breath, not entirely sure what they are about to be a part of. The men on the couches can feel the silent attention of the audience, and the grip of their own nerves. They are from different generations and live different lives, yet there is a commonality which binds them. Inside, emotions churn at the thought of what they are about to do, but they have faced fear many times, and their body language remains relaxed. One after the other, the men arise and find the podium where they share their writing—memories that some have held to themselves for over forty years. Quickly, the audience realizes that they are a part of something very special. During Boulder, Colorado’s second annual Veterans Speak “Prose and Poetry” event at the Boulder Public Library, those in attendance experienced an extremely rare glimpse into the most personal insights of local military vets: From Vietnam, a Marine recollects youthful humor, hormones, and the deadly contest for life and death. He is followed by a Navy doctor who recalls the combat field hospital where he saw the worst and best of humanity. Another shares the heart-wrenching experience of surviving deployment with his buddies in Iraq, only to lose one of his closest soldiers to suicide. Others speak of a career cut short by cancer, suicide bombers at the gate, the loss of friends in combat, rounds cracking in the Afghan morning, and the plight of civilians on the battlefield. Did the audience leave with a better understanding of our veterans? I have no doubt that they did. I also believe that there was a more profound realization attained there that night. We all have our own battles to fight, anxieties to face, and the choice between living only for ourselves or making decisions which serve others as well. What can the general public take away from the stories of our veterans? Often I am asked by civilians, “what can I do to help vets, and to honor them?” Obviously there are numerous charities and causes we can all support for the wellbeing of our returned warriors, but I also would submit that the best thing you can do to honor the sacrifices made by our military members is to make a better America by doing whatever it is you do to the best of your ability. That means approaching your profession, personal development, and community with the dedication of a warrior, the selflessness of a soldier, and the compassion of an elite operator fighting for the oppressed. I believe the lessons of our veterans should reach beyond simply creating sympathy and silent respect. Let’s integrate their strength, motivation, courage, and compassion into our business, innovation, economy, politics, and environmental legacy. Inspiration is the start of all good things, and inspiration abounds in the stories and skill-sets of our vets. Honor them by learning from them and applying it to your own journey. 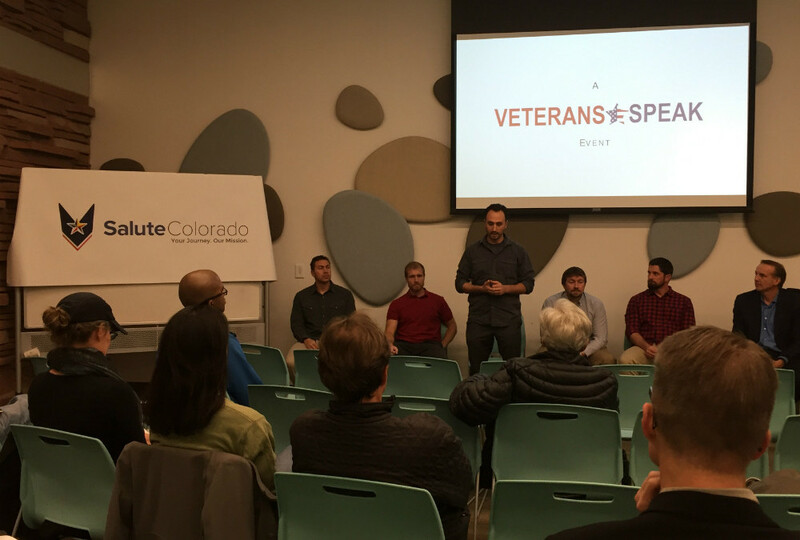 The Boulder community has taken a big step to giving a voice and relevance to our military members through a full month of Veterans Speak events. For the second year, I had the honor to stand among these vets and share my own experience in Afghanistan through literature. Following the event, I was further blessed when asked by Colorado Public Radio to read an excerpt of my piece on the air during Veterans Day. A recording of this segment can be found on the original article. We will soon feature more literature from our veteran writers for you to enjoy and grow from. I had started the dark of that morning as someone who had never been shot at before. Quickly, that reality had disintegrated, and seven hours in, the sustained sound of gunfire seemed like the only thing I had ever known. Just a sound really, I tried to recall it. Hammering, crackling, snapping. The moment I first heard it I knew it deep in my DNA. Men trying to kill each other, business-like; men trying to save the lives of their stranded brothers, a love unexplainable. I tried to remember feeling any kind of emotion at that moment in a day of moments, but there was nothing. Over the months since returning from Afghanistan, I had carried that memory, along with many others, like disjointed little video clips. Now, standing on a narrow trail halfway up the foothills of the Rocky Mountains, I thought about that memory again—and I watched. The sun was painting every rock and illuminating each leaf, and the glowing green soothed me—but as I watched the Aspens quake, I tried to conjure that memory to surface. Small, juicy green leaves fluttering almost happily on little white twigs in the breeze.Didn’t they look so much like them? The memories didn’t bother me most of the time, and why should they? I had been well prepared for combat, and more importantly, I’d been lucky. Those incidents were nothing more then normal things that happened every day in Afghanistan. Maybe not to you, but to someone. Overheated, dehydrated, adrenalized for hours—I had just run back toward the cover of the armored wrecker truck. A few paces before reaching its protection, I’d slowed to a walk. It was my first fire-fight, and I’d already grown dangerously complacent about gunfire. Looking back, I had to admit that my complacency was partially due to the fact that I hadn’t yet fully comprehended what the different sounds bullets made when they passed nearby could tell you. That, I would learn in time. Safe in Colorado, I turned that little vignette in my head once again, and no, I didn’t recall a single emotion when I had watched, slack-jawed, as those tiny white twigs popped and summer-salted to the earth next to me. What was I missing? I’d always heard veterans talk about how vivid their memories still were of first combat, even decades after the fact. For me, there were large chunks of my days in battle that were blurry at best, and that was beginning to annoy me. Interspersed throughout, there were a good number of short but relatively clear little memories, and my investigation of these was beginning to grow more purposeful. Maybe if I examined a larger slice of that scene it would help reveal something. So there I was, standing behind that armored wrecker, looking out across a golden field towards long mud-built walls and compounds to the East. Fire had been coming from that direction all day, and somewhere enemy guns still sent bullets popping and wandering about. A lot had happened since the mission kicked off shortly after 0330 that morning, and now it was around noon, and the temperature had risen to above 120 degrees Fahrenheit. I was standing static at that moment, trying to conserve precious drops of energy, but my mind wasn’t still. I scanned constantly, hoping to catch a glimpse of something in a distant rough formed window, or hole in a wall, that I would be justified in shooting at. The enemy had set up his fighting positions well, though, and the only people I could see were a woman in a bright dress, and a boy in black lingering in a small patch of crops next to a mud house with tiny, glassless windows. It was amazing how casual the villagers were about combat in this town. Most had bugged out of the area on this particular morning, but I’d seen a few, and just accepted them as a natural part of this bizarre enterprise I was involved in. All kinds of fire had raked that field from both directions, yet that boy and woman sat almost motionless in their sparse garden as if nothing were going on. As an American soldier, I wouldn’t entertain the idea of shooting anywhere near civilians, unless it was to put precision fire on a visible enemy with a weapon. The Taliban didn’t wear uniforms, though, and I’d heard that they put their guns down when moving between stocked fighting positions, making positive identification—what we called PID—rather difficult. So, with rounds still emanating from the field, I scanned hopefully but held my fire as was appropriate. As usual, I shared the field that day with more Afghan soldiers than Americans, and they did not feel bound by the same guidelines. About fifty meters to my left, First Sergeant Shafiq was up in the turret of a HUMVEE, blasting away with gusto on an M-240 machine gun. Does he have a fix on the enemy gunner? I wondered. Only a small handful of us were holding this part of the road at that late and spread out stage of the fight, so his energetic duel with the opposite gunner seemed more than appropriate from where I stood. Hollow-eyed, I peered across the field, trying to glean anything actionable from what lay before me. Now I saw something that wasn’t right, even by the standards of the day. The woman and boy were still sitting in their garden, or were they on their knees? My heart began to pound as I realized the long bursts of bullets from Shafiq’s machine gun were tearing up the earth around the two civilians, sending up momentary spouts of dirt within feet of where they held frozen. There were no warning bells left to go off in my head, but I said to myself, No. I have to go tell Shafiq that there are a woman and child over there. Yes…No. That is not what we do. I have to go tell Shafiq. With a transmission of doubt crackling in my brain, I decided to move from behind the armored vehicle. What I perceived as my duty to deliver that message trumped all other considerations. In a war that often lacked clarity, one thing was clear in my mind. We don’t knowingly harm civilians, and it is our job to protect women and children, no matter where they are from. That was core to my belief in what a US soldier could still bring to a world clogged with shady politics and hidden motives. It was core to the warrior code that I had adopted in my mind starting at a young age. I’d been moving up and down that road all day, so it was without much to-do that I broke cover from behind the armored vehicle and ran up the open street exposed to the field. Just to the rear of the Humvee that Shafiq was firing from stood an interpreter whom I knew. He was a tough guy, very reliable, and he also happened to be the biggest Afghan that I or any other American had ever seen. Somewhere along the way, someone had bestowed him with the name “Thor,” and it stuck. Shafiq didn’t break his focus on the sights of his machine gun as I drew near the Humvee. “Hey!” I yelled as I came to a stop next to the vehicle. “Thor, there is a woman and a kid over there. Tell him to stop shooting.” Thor moved over from where he was standing and got Shafiq’s attention to deliver my message. The Afghan First Sergeant stopped firing just long enough to look down at me with annoyance, and give his reply in Dari. Thor turned to me and said simply, “They are shooting at us from there.” He shrugged, and returned slowly to his position behind the Humvee. As Shafiq got back on the trigger, I turned my confused gaze in the direction of the target in question. With a long squeeze, he sent a nice line of rounds stitching through the dirt, right past the woman and boy, and into the wall behind them with the small windows. I squinted, trying to see through a fog that didn’t exist. I guessed the enemy gunner was firing from one of those windows, but why hadn’t the woman and child moved? I felt helpless. I couldn’t kill the bad guys, and I couldn’t protect the innocent, who were apparently on their knees not moving. Or maybe they were sitting? Shafiq and the Taliban gunners, wherever they were, weren’t going to stop shooting while I tried to figure it out. I was in their world and didn’t know much. The one thing I did know was that I probably shouldn’t stand there any longer. This is where things get blurry again. Maybe it was the oppressive heat or the fatigue, or the conundrum in my head. How fast did I run back between the two vehicles? How many times had I been shot at that day that I casually sauntered the last few feet towards the bumper of the wrecker? I had grown numb to the sonic crack that occurs when 7.62-millimeter rounds came overhead. I was facing in the direction that I had been running when I stopped, and to my right I saw little white twigs, with plump little green leaves on them, snapping off of the tree branches. It occurred to me that I should step behind the truck, and I did. Ten months after that firefight, and six months after returning from Afghanistan, I stood alone amidst the beauty of Spring in the Rockies, replaying this curious little memory in my head. I marveled now at the fact that the woman and boy I had seen kneeling in the field, directly in front of the Taliban machine gun position, were dummies. Fakes. Empty clothing draped convincingly on unfeeling frames. Were these figures just scarecrows meant to keep birds out of the veggies, or were they purpose built to scare away American bullets? Either way, the Taliban gunner had intentionally set up his position behind them. He was confident enough in the fact that American soldiers don’t shoot at women and children that he trusted his own life to the decoys. What he hadn’t counted on was a uniquely committed and reasonably crazy Afghan First Sergeant with an American machine gun, who either wasn’t impressed by the ruse, or simply wasn’t going to let a couple of civilians on the battlefield keep him from his enemy. In Afghanistan, it was just another one of those things. Like being amused by tiny tree branches twirling through the air while someone was trying to kill you. Like the fact that they were shooting at you because you broke cover to try and protect what you thought was an Afghan woman and child. I had come to accept and even embrace these things. It was how I did my job. A job that I frankly loved. But now I had been back in what we for some reason called “the real world” for a bit too long, and those little brushes with death were starting to seem more concerning. The comfort of commonplace was fading, and now those experiences demanded to have meaning for some reason, only it is hard to pull meaning out of hazy, heat soaked, and all too surreal memories. As I stood thousands of miles from the battlefield, surrounded by the beauty of Colorado, I was still unable to recall any significant emotion as I watched those little twigs getting shot from the branches above my head. What did change, was that now there was a distinct feeling of fear and realization associated with that little video clip in my heart. What was normal in Afghanistan was not normal here, and months after coming home, it was just beginning to sink in. My God, I thought, there were dozens and dozens of these memories to process and a lot of them were loaded with way more baggage than this one tiny scene from a dusty village called Jangal Rud. Your writing just gets better and better.